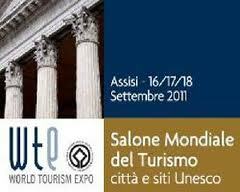 Dear exhibitors, we are very glad to propose you the second edition of the WTE World heritage tourism expo, an event reserved to the UNESCO sites and cities to be held in Assisi 16 to 18 September 2011. The excellent results of the first edition induce us to improve both the organizational aspects of the exhibition and the scientific contents to develop during the three meeting days. We will bring the event forward by about two months, in mid-September when our City is invaded by tourists from all over the world so to rely on a vast public especially on Saturday and Sunday. The exhibition will offer the exhibitors real chances to get in touch with more than 100 Italian and foreigner Tour Operators that we want to invite to the event considering the enthusiasm shown at the end of the first edition. The aim is a “circuit-maker” realizing an endearing tourist circuit able to involve a larger number of international tour operators that bring responsible tourists closer to these locations. Conferences, panel discussions and resuming with journalists and experts will look at the world of the cultural heritage. Hoping to have you among our exhibitors of the second edition of the WTE, our staff is at your complete disposal to arrange and define together the best and the most efficient presence at our exposition.